This post will discuss how to develop a robust gap analysis to identify any significant shortcomings between the current and desired end states. We use these findings to begin develop strategy alternatives (and related initiatives) to address what has been uncovered. Our intent is to identify the difference (delta) from where we are to what we aspire to become. This exercise is critical to identify what needs to be accomplished. The gap analysis leads to a well-organized set of alternatives and viable strategies we can use to complete the remaining work. We are seeking a quick and structured way to define actionable activities to be reviewed and approved by all stakeholders. This includes identifying a set of related organizational, functional, process, and technology initiatives needed (I will address the architectural imperatives in another post). The gap closure recommendations provide a clear line of sight back to what needs to be accomplished to close the “delta” or gaps uncovered in the analysis. While every organization’s “reach should always exceed its grasp” we also should understand the need to introduce this new discipline in a measured and orderly manner. There are many good (and a little too academic for me) books and writers who have addressed this topic well. What is different about my approach is my need to identify specific actionable activities we undertake in a consistent way to change into what we aspire to be. There are a couple of ways to do this. Remember all three dimensions referred to above should be considered in this analysis. A helpful outline should include questions related to each of the three aspects in our work. Note, this is a generalized example, and represents three distinct entry points to evaluate. Further exploration into any of these three is usually needed for developing the detailed planning products in later phases. Using this approach we can attempt to reveal quickly where significant gaps exist and explore further as needed. So let us focus on the key themes early to guide our work moving forward. Is the organization is ready to embrace the initiative? Have we identified baseline adoption of fundamental management capability across both business and technical communities that can be leveraged to drive the effort? Do plans exist to execute immediate actions to address missing operational capability (gaps)? Is there evidence of detailed planning to stage and execute the transformation? Have we consciously chosen maturity jumps in a measured and controlled manner? Have we clearly articulated the associated operational impacts to the stakeholders? Are capability-based plans included or needed at this time? Have we accounted for internal and external bandwidth in capability and core competency? Have we factored in enough time to stabilize the management foundation and professional community? Are there critical dependencies with other ongoing programs? – Is there an effort underway to secure the participation of critical roles and key personnel? Is there evidence that exists that marketing the compelling vision is occurring in an organized manner? Is there an effort to quantify and repeatedly communicate the value to the organization? Has the “what’s in it for me” messaging for critical stakeholders been developed? Are goals and objectives communicated in a consistent, repeatable manner? Is there a need to proactively Manage Stakeholder Buy-In? Have we created opportunities for stakeholder involvement? Are there incentives to align and reward desired behavior? Do we need to develop and enhance change leadership? Assign dedicated transition management resources to the effort. Strong Governance and Oversight roles accepted and adopted as a critical success factor? Is there active executive sponsor involvement? Are line and staff managers accountable for progress to plan? Need to institute a comprehensive and open communication plan that publishes program information to the organization in a consistent manner? Has the operating model been defined? Ensure that introducing and adopting new processes are aligned to business intent. Can we leverage reuse of existing assets where possible? What about developing necessary Management and Business User Skills? Are there significant gaps in the current architecture or environment that would prevent successful delivery? The gap closure strategy should include specific recommendations for building organizational capability and driving commitment to this effort. 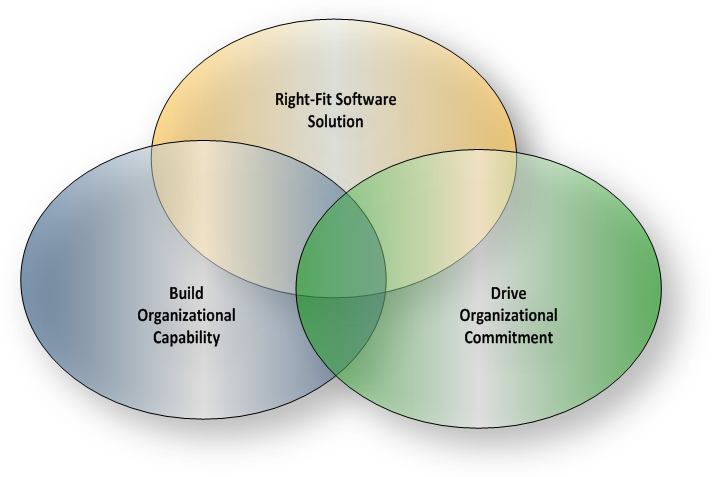 In addition we should ensure to right-fit a technical solution the organization can grow into as it achieves widespread adoption across the enterprise. The approach is carefully weighed to align the three perspectives to ensure our gap closure strategy recommendations are not used to build a system whose complexity exceeds the organization’s capability to deliver. People/Organization considers the human side of Information Management, looking at how people are measured, motivated and supported in related activities. Those organizations that motivate staff to think about information as a strategic asset tend to extract more value from their systems and overcome shortcomings in other categories. Policy considers the message to staff from leadership. The assessment considers whether staffs are required to administer and maintain information assets appropriately and whether there consequences for inappropriate behaviours. Without good policies and executive support it is difficult to promote good practices even with the right supporting tools. Process and Practice considers whether the organization has adopted standardized approaches to Information Management. Even with the right tools, measurement approaches and policies, information assets cannot be sustained unless processes are consistently implemented. Poor processes result in inconsistent data and a lack of trust by stakeholders. Technology covers the tools that are provided to staff to properly meet their Information Management duties. While technology on its own cannot fill gaps in the information resources, a lack of technological support makes it impractical to establish good practices. 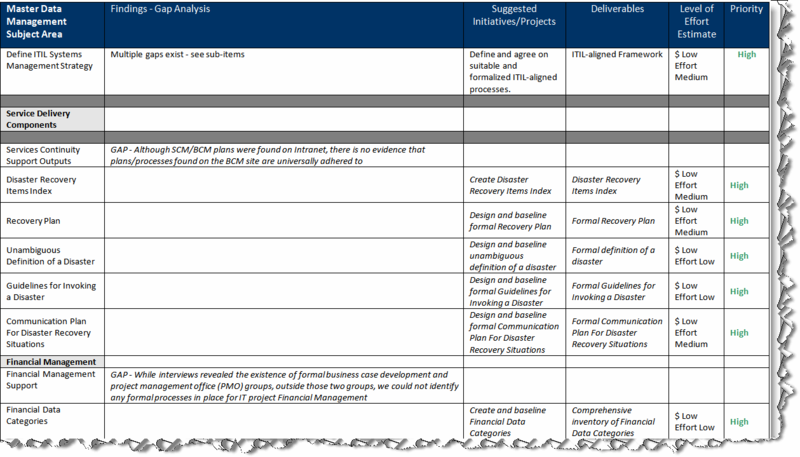 The questions in the quick scan tool used in a prior post to define our end state were organized around six (6) key groups to include Organization, Policy, Technology, Compliance, Measurement, and Process/Practice. This is a quick way to summarize our findings and provide valuable clues and direction for further investigation. We can then focus on specific subject areas using detailed schedules based on the field work to date. Based on the subject gaps uncovered at the higher level summary (Current vs. Desired End State) further investigation should be performed by a professional with deep subject matter expertise and intimate knowledge of generally accepted best practices. In fact it is best to use prepared schedules in the early field work (if possible) to begin gathering and compiling the facts needed during the interview processes to mitigate “churn” and unnecessary rework. For example, in the Process/Practice area we can use the Information Technology Infrastructure Library (ITIL) to uncover any significant gaps in the Service and Support delivery functions needed to support the defined end state. Detailed schedules can be compiled and the organization’s current state evaluated against this Library and other best practices to ensure the necessary process and practices are in place to enable the proposed end state solution. The following fragment illustrates an example schedule related to Service Continuity Management. 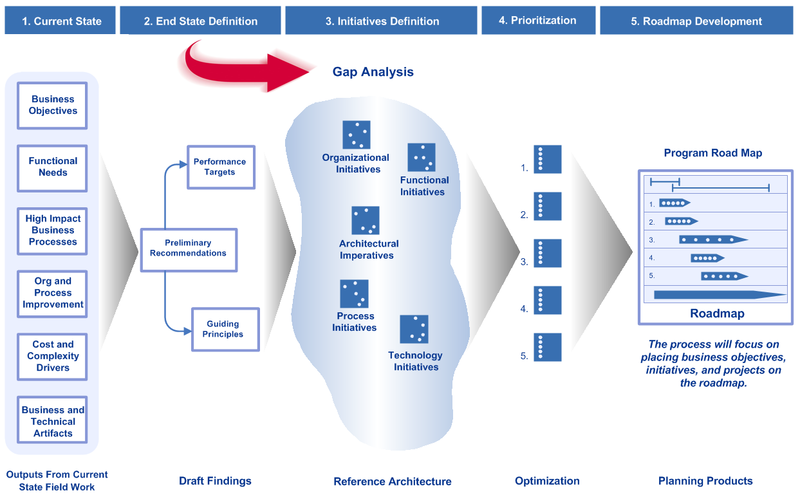 Using this schedule we capture our findings, suggested initiatives or projects, expected deliverables, level of effort, and relative priority of the gap identified. This is a quick way to summarize our findings and prepare for the next step (4- Prioritize the findings from the Gap Analysis exercise into a series of gap closure strategies). 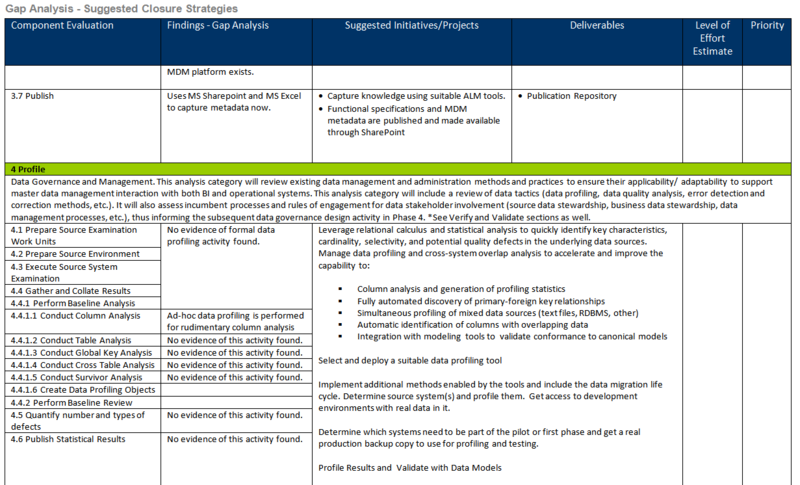 In another example this small fragment form a Master Data Management (MDM) related gap schedule addresses specific Data Profiling activities expected within the context of a Party or Customer supporting function. What is clear from this schedule is that no evidence of profiling has been found. This is a significant gap in the MDM domain. We should have some idea of the relative quality of the data sourced into our platform and be able to keep our customers informed as to what level of confidence they should expect based on this analysis. This represents a clear gap and should be addressed in the roadmap we will develop in later stages. I think you can see this is valuable way to quickly gather, compile field work, and capture a fairly comprehensive view of the gaps uncovered between the current and desired end states of the domain in question. Armed with this information we can now proceed to step four (4) and begin to prioritize the findings from the Gap Analysis exercise into a series of gap closure strategies. This is an invaluable way to assemble and discover the optimum sequence of actions (recognizing predecessor – successor relationships) as we move to developing the road map. This difference (delta) between these two (current and desired end state) is the basis for our road map. I hope this has answered many of the questions about step three (3) Conduct a Gap Analysis exercise. This is not the only way to do this, but has become the most consistent and repeatable methods I’m aware of to perform a gap analysis quickly in my practice. This entry was posted in Enterprise Architecture, Methodology, Organization Dynamics, Roadmap Development and tagged Methodology, Roadmap development. Bookmark the permalink. homework on this. And he actually bought me breakfast due to the fact that I discovered it for him.
! But yeah, thanks for spending the time to talk about this topic here on your blog. When we will have the posts about the next steps…? Thank you; planning on publishing the Prioritization step next week (last week in June 2013).